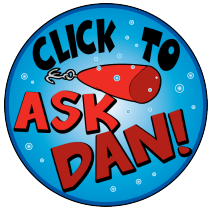 Ask Dan Your Question About Saltwater Fishing! I am looking at Daiwa fishing reels but not sure which I need, can you offer some advice? do you need aspecial kind of rod to fish off pier, can you use a fresh water rod and reel thank you. I have never been sea fishing. Can you tell me what gear I would need for my first trip this summer? What bait will catch more striper? Is chicken livers a good saltwater bass bait im san diego ca? Will this same bait work.for bonito too?